Wat Pho is a Buddhist temple complex in the Phra Nakhon District, Bangkok, Thailand. Known also as the Temple of the Reclining Buddha, the temple is first on the list of six temples in Thailand classed as the highest grade of the first-class royal temples. 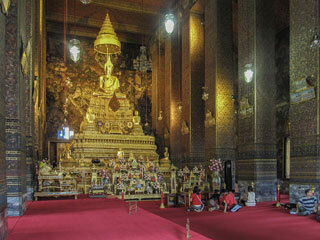 Wat Pho is one of Bangkok's oldest temples. It existed before Bangkok was established as the capital by King Rama I. This article uses material from the Wikipedia article "Temple of the Reclining Buddha", which is released under the Creative Commons Attribution-Share-Alike 3.0 License.